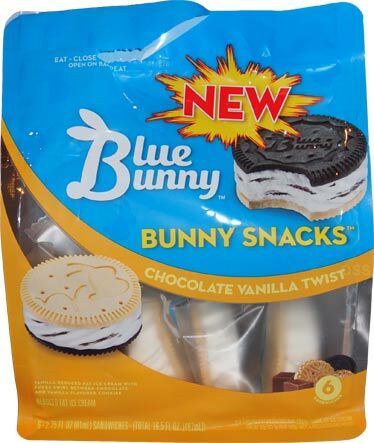 [New for 2017] So Blue Bunny has unveiled four "new" Bunny Snacks to us this year with each variety coming in a bag of six treats. I say it like that because two of the snacks are just funwiches with their stick removed. This is kind of an unusual tactic to take but maybe they got feed back saying that the stick was in the way. Let's try one of the truly new treats. See thru big pouch, see thru little pouch. Awww, such cuteness with the little bunny tracks. 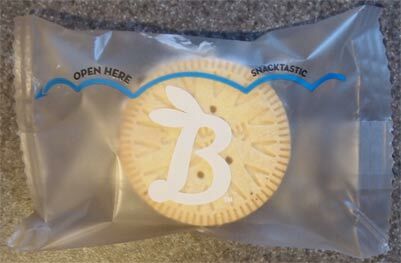 My first experience with these was on the way home from the grocery store. Dinner was too far away and I was hungry. I was not a fan at first. I could say the wafers were dry, but I need to be more specific. They kind of have this odd kind of corn flakes taste to them. I know that sounds crazy but that's just how it tasted fresh out of the freezer. With the filling being so light texture-wise and mildly flavored, it had trouble competing with that flavor that was coming off the wafers. On Second Scoop: A new day and another two treats eaten. I only meant to eat one, but as I was dissecting it for pictures, I thought it wasn't as bad as I thought yesterday. I ate the wafers directly to really try to gauge what has bugged me the day before. I also dug in to the very soft ice cream which doesn't add a whole lot. As I then proceeded to have another here and another there, I realize that I don't want to give the impression that these are flat out bad. I just don't think they click like they are meant too. 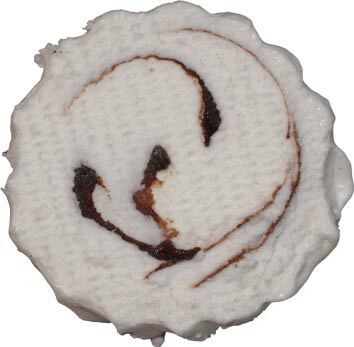 Maybe the fudge swirl is supposed to counteract the wafers a bit more. 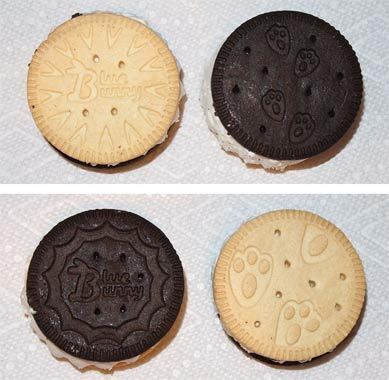 Maybe it was originally two vanilla wafers but they wanted to be different. I don't really know. What I do suspect is that no one is going to complain if you give them one of these, I just don't think they'll ask for a second one because they loved it (though they might ask for a second one because they would probably still be hungry). Foot Note: Technically, you could open all the pouches and make 3 chocolate sandwiches and 3 golden sandwiches. I would try this myself but I only have one sandwich left. How big are these? They remind me of ice cream filled oreos but I'm hoping they aren't that small? Oops, forgot a size comparison photo but you can use the calorie count of 140 to envision that they arent very big. They are about two Oreos thick and about a third wider. Why even review Blue Bunny? Every review is going to be a variation of "a starving hog would turn up its nose." Ummm, are you saying you hate blue bunny or that it seems like I hate blue bunny? I assume it's the first since for the most part I like blue bunny though I am concerned that their texture/density is getting cheaper.